*Come with 3 outlets + 4 USB ports + 3m extension cord. *Non-Flammable housing can withstand great heat. *Flexible switch can automatically turn off in an overload situation for appliances protection. *USB smart IC chip adjusts and distributes the optimal output for safe and quick charging. 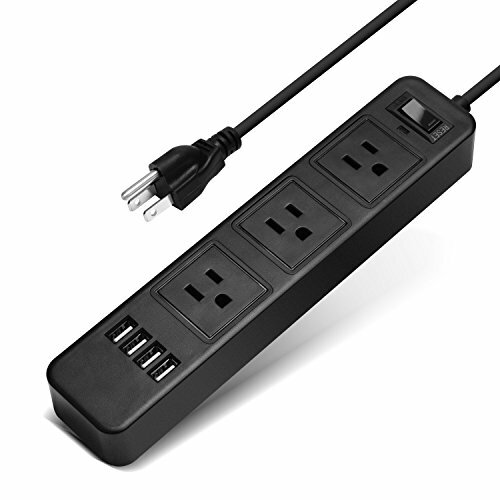 MULTIP-USE: Combination between outlets and USB ports power strip, suit for computer, microwave oven, cellphones, tablets, speakers, power bank and other electric appliances(under 3000W) or other USB powered devices at home, office or travel. DURABLE & RELIABLE: Make of PC+ABS fireproof plastic, RoHS, CE & FCC Certificates. This electric power strip outlet is lightning-proof, overload protected and surge protected. It will automatically cut power to protect connected devices when voltage surge is detected. LONG EXTENSION CORD: With a long cable of 3m/9.8ft, this desktop extension lead won't put you into a dilemma that your extension lead cannot reach your desk after you plug it on the wall. SATISFACTION GUARANTEE & PACKAGE: 100% satisfaction guaranteed! 60 days changing or refunding without reasons. Any problem of the product, please feel free to contact us, we will get the problem settled as soon as we can.